"The Mat That Soaks Up Water Like a Sponge!" Say goodbye to puddles on your bathroom floor! Place the Power Threads Microfiber Bath Mat on the floor outside your bathtub or shower and it soaks up water like a sponge. Plus, the microfiber material dries quicker and has a much softer feel than cotton or poly/nylon bath rugs. No other mat performs as well, even at many times the cost. This luxurious beige colored, microfiber bath mat provides a spa-like feel that is durable and cost effective - it can be washed hundreds of times. 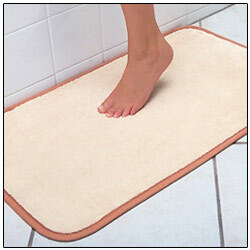 Simply put, the Power Threads Microfiber Bath Mat far out-performs any bathroom rug that is available in the market. Buy it now to put an end to messy bathroom floors!